An independent Scottish firm has launched a blended malt Scotch whisky in a bid to shake-up the market and challenge traditional perceptions of Scotland’s national drink. 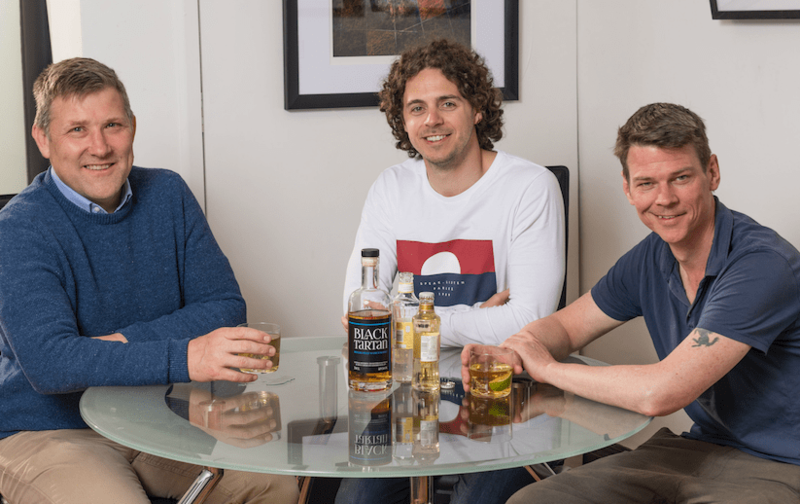 Edinburgh-based entrepreneurs, Andrew Skene, Tom Melville and Alexander Harrison have created Black Tartan as an “improper Scotch” that challenges the “elitist” view of “thou shalt not mix” whisky. The product takes its name from the “black” of the highly charred casks the spirits are matured in and “tartan” to represent the blend of whiskies. The “marriage of malts” has a slightly sweeter taste than is usually associated with Highland whisky due to its maturation in highly charred barrels. Black Tartan creators say this process releases a distinctive, sophisticated bourbon-like flavour which allows it to be at once robust enough for mixers, and smooth enough to be enjoyed neat or over ice. Andrew Skene said: “Black Tartan is a new, fun brand of Blended Malt Scotch Whisky. It’s an authentically Scottish but modern, hand-crafted whisky. It’s designed, distilled, blended, bottled and owned in Scotland, by Scots. “We find the traditionally held view that Scotch should never be mixed and should be tasted in a certain way, elitist, snobbish and cliched. It represents a barrier to some people to even trying whisky because they are put off by the ‘rules’ around it. “We’re trying to do our bit to change that misconception and reach out to new generations of whisky drinkers. We want to keep it real and let people drink Scotch any way they want to. “It’s totally up to the individual drinker and that’s the point – if you only like it neat or with water then go for it, because that’s a great way to enjoy it. But it’s not the only way. As a Blended Malt – one of the five official categories of Scotch Whisky – Black Tartan is made up of a blend of a small number of Single Malts made at more than one distillery in the Scottish Highlands. It is therefore different from a Blended Scotch – by far the biggest category of whisky, making up around 90% of Scotch exports – which contains a mixture of Single Malt and Single Grain whiskies. It also stands out from Single Malts which come from only one distillery. Blended Malt is a relatively untapped part of the market and Black Tartan believes it has great potential to grow by offering consumers something new and different. Official HMRC figures reveal that in 2017, Bottled Blended Malt Scotch Whisky exports were only worth 1.8% of total Scotch exports which reached £4.4 billion. And after declining for a time before 2015, bottled Blended Malt exports have started to take off, increasing from £48.3m 2015 to £75.7m in 2016 and then up to £77.8m last year, so the trend is in the right direction. Black Tartan is targeting a number of key markets, including the UK, other parts of Europe and Asia Pacific. Mr Skene added: “There is a snobbishness that unfortunately puts some people off Blended Scotch. And many people say they will only drink Single Malts, but as we know these can be very expensive and in limited supply.